Vídeo demonstrativo da imagem Orange Pi PC - RetrOrangePi 4.1 Especial Playstation & PSP by Derival de S. Bispo (16GB), com diversos jogos do PlayStation 1 (PS1) e PlayStation Portable (PSP). A imagem é EXCLUSIVAMENTE para a placa Orange Pi PC. Por padrão, não funciona em outras placas, exceto você altere arquivos de programação da imagem. NÃO tenho tutorial sobre isso. Sugiro pesquisar sobre programação de RetroPie. » Battle Hunter, Bomberman Fantasy Race, Castlevania - Symphony of the Night, Crash Bandicoot 2 - Cortex Strikes Back, Crash Bandicoot 3 - Warped, Crash Bash, Crash Team Racing, Dead or Alive, Digimon Rumble Arena, Dino Crisis 2, Dragon Ball GT Final Bout, FIFA 2000 - Major League Soccer, Jackie Chan Stuntmaster, Medal of Honor, Megaman Legends 2, Megaman X6, Mortal Kombat - Special Forces, Motocross Mania 2, Nightmare Creatures 2, Nightmare Creatures, Power Rangers - Time Force, Quake 2, Rageball, Raiden Project, Ready 2 Rumble Boxing, Resident Evil - Director Cut (Dual Shock), Resident Evil - Survivor, Resident Evil 1.5 (Beta), Resident Evil 2 (Dual Shock) - Leon Disc, Resident Evil 3 - Nemesis, Samurai Deeper Kyo, Shrek Treasure Hunt, SimCity 2000, Spider-Man 2 - Enter Electro, Spyro the Dragon, Tenchu, Tom Clancy's Rainbow Six - Lone Wolf, Tomb Raider 2, Twisted Metal 4, Vampire Hunter, Vigilante 8, Winning Eleven World Soccer 2002 e Worms. » Harry Potter & The Half-Blood Prince, Hello Kitty Puzzle Party, Heracles Chariots Racing, Holy Invasion of Privacy Badman, Homerun Hitters, International Snooker, Jack Destripador, Kahoots, King of Pool, Kurulin Fusion, Legend of Kunoichi, Luxor - Pharaohs Challenge, Luxor II, Marvel Nemesis ROTI, Military History Commander - Europe at War, Mind Quiz, Monopoly, Monsters Stole My Princess, N.O.V.A, N+, Need For Speed Most Wanted, No Gravity The Plague Of Mind, One, Two Boat Racing, Pachisi, Petz Dogz Family, Pile Up! Bakery, Pinball Duel, Pinball Fantasies, Puzzle Scape, Ramen Heaven, Red Bull X-Fighters, Rocket Racing, Route 66, Savage Moon - The Hera Campaign, Scrabble, Sheep Defense, Shogi, Smash Break, Sneezies, Space Invaders Extreme, Spaceball Revolution, Stand O' Food, Sudoku, Sweet Reversi, Telegraph Crosswords, Terminator, Thexder Neo, Tiger Trouble, Tonzurakko, Toy Story 3, Ultimate Board Game Collection, UNO, Vector TD, Vempire, Yety Sports, Young Thor, Yummy Yummy Cooking Jam, Zenonia, Zombie Tycoon e Zuma. Vale destacar que a lista de jogos foi escolhida conforme o desempenho no emulador. 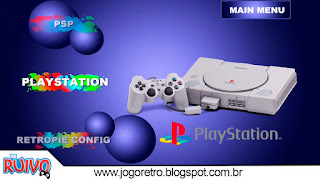 Alguns jogos clássicos do PS1, por exemplo, ficaram de fora devido ao mal desempenho.